How much lighting? Where to locate it? 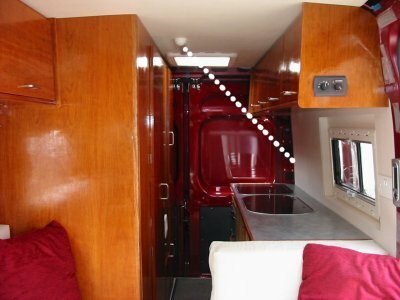 Once we had decided on a front-lounge layout we could then decide what electric lighting would be required. 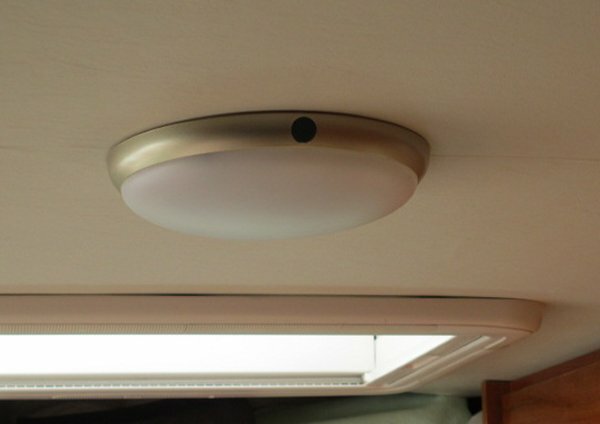 In our old caravan there were two lights fixed to the ceiling: one circular light in the centre of the lounge at the front, and one strip-light over the kitchen unit at the rear. This worked fine for general lighting. Also, at the front, fixed to the overhead lockers, was a spotlight in each corner that covered the seating/bed areas so one could read whilst the partner could sleep in subdued light. It was a simple arrangement so we used that as a basic plan. 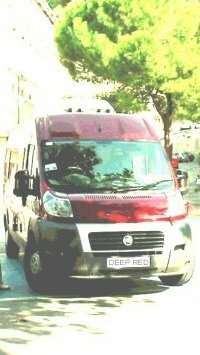 We also looked at Pro conversions; many had a similar basic arrangement, but some also add lots of small LED downlights dotted all over the place - to create 'mood', we suppose. It was important to decide on the basic light positions early on so that we could install plastic trunking for the cables before fixing the ceiling ply in place. Having decided on the position of the kitchen unit, and that we would have an overhead locker above it, meant the kitchen striplight would need to be positioned so that the locker did not mask the light and place the kitchen worktop (and contents of a saucepan) into shadow. The dotted line in the pic hopefully shows what we mean. A person standing in front of the unit does mask the light a little, but, in practice, we've found it works fine. 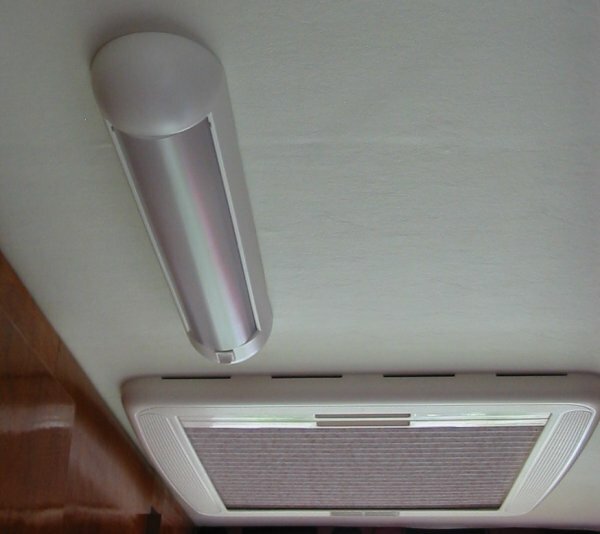 One could add a LED striplight to the underside of the overhead locker, which actually would help when it's very dark outside, or if the blinds are drawn. There are many types of 12 volt electric lights available at caravan/motorhome parts stockists including the old reliable fluorescent; the car-type old-fashioned bulb (now rare); and more recent halogen and latest LED (light-emitting-diode) version. 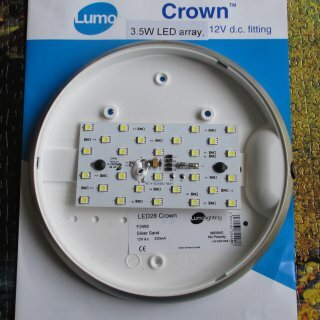 All have different characteristics: the fluorescent tend to have reasonably low current drain and give out an orange tinged warm light; the new LED types have very low current drain and some give out a very bright, almost clinical, white light; the halogen are usually a bright white light, but often high current drain and can get very hot - most folk are replacing those with LEDs now. A look through the CAK Tanks on-line brochure will show a huge selection (see Sources). For the lounge we originally chose this inexpensive, 9 watt fluorescent light incorporating an on/off switch, and fairly low current drain (0.75amps). This proved adequate for the area it covers, but in dark evenings in winter when the light was on for 4-5 hours, trying to read with just this light was a strain. 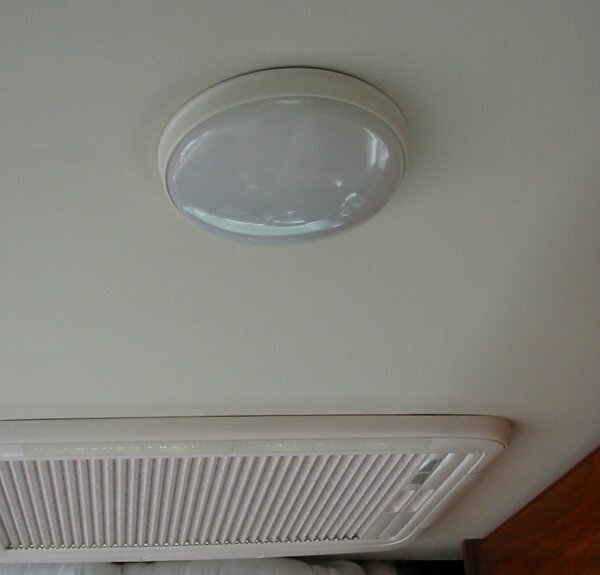 When we replaced our leisure batteries we changed the main lounge light for something brighter and, after much searching, eventually found this LED light on-line. The LED light is slightly bigger diameter (210mm) than the old light. It has a rather fiddly on/off switch, but gives out a much brighter white light with only 320mA current drain - less than half the old fluorescent one. Mad Mumsie says it is a big improvement over the old fluorescent when she is doing a jigsaw. Claims for these LED lights suggest they will last thousands of hours. LED Light with lense removed. Two loose wire tails at the rear allow 12v connection. No screw terminal connector block is supplied to join to the feed wires - which is surprising given the cost of this light - at £42 it ain't cheap! The kitchen strip light is 11 watt (0.92 amps) fluorescent and also has an on/off switch. 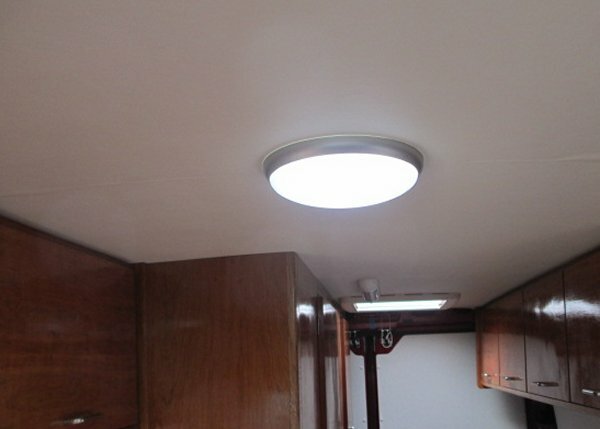 This light is excellent, bright with good light pattern and inexpensive. 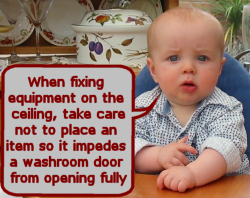 Fluorescent tubes are inexpensive and easily replaced - not had to replace one yet in over 5 years. 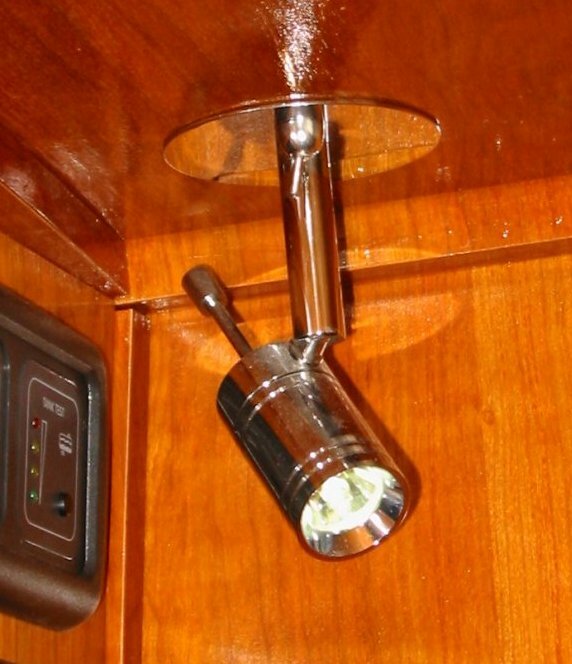 Mounted at each end on the underside of the locker above the sofa are 12volt single LED spotlights. These have integral on/off switches. The bases are flush panel fitting type and require a 50mm diameter hole cut in the ply panel. The wiring terminal block and spring fixing for the light base are inside the locker. There are also types which can be surface mounted with screw fixing. This is fairly straightforward. See also wiring diagram in Electrics section. 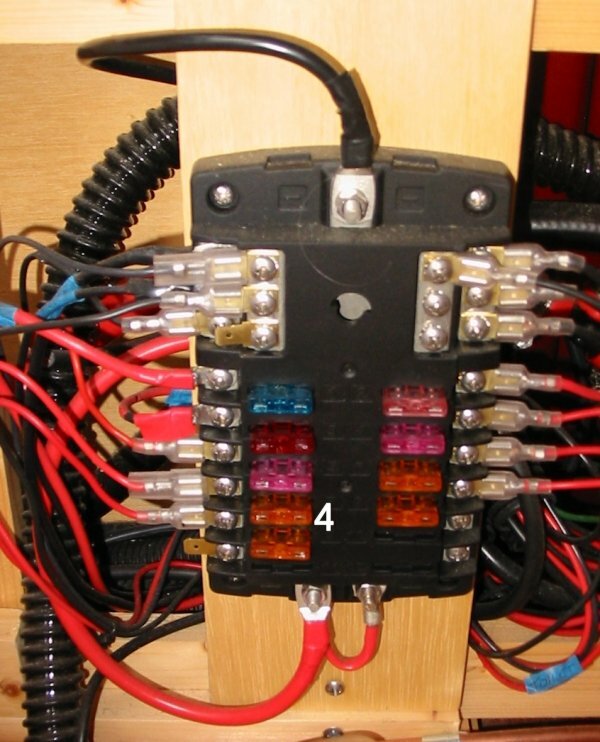 Two wires run from the 12volt fuse distribution block (red wire via 5amp fuse at terminal 4, black wire from the negative connection block at top of fuse block) to an on/off switch on the control panel. 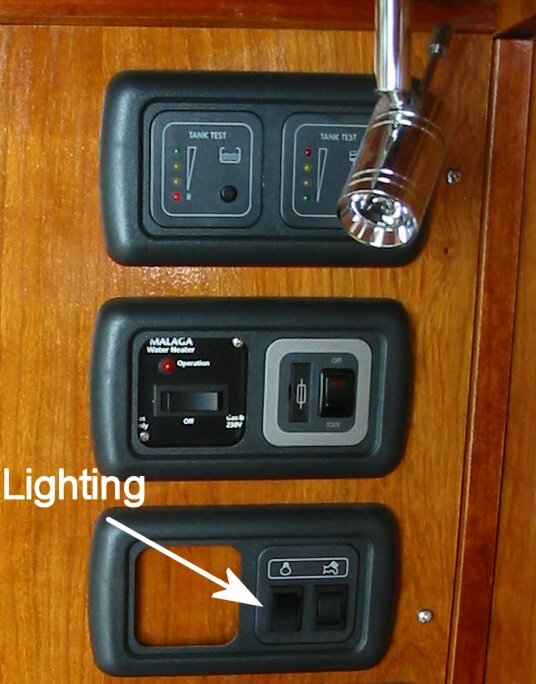 Multiple terminals on the control panel on/off switch feed separate two-wire feeds to each light. This allows all lights to be turned off at once from the control panel. It's not really necessary to have this switch, as all lights have their own on/off switches. The original idea was that one could turn everything off from lying in bed! - that doesn't actually happen as usually it's just one spotlight that is in use and can be reached from the sofa. 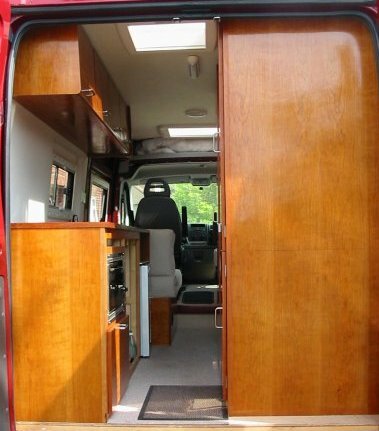 All cables are run in circular, black, flexible conduit within the van structure and fixed with cable ties, and in rigid plastic tubing across the ceiling in gaps in the insulation behind the ply lining.